BRITISH COLUMBIA – Despite early delays due to forest fires and inclement weather, Seabridge Gold of Toronto is meeting its objectives at the KSM project 65 km northwest of Stewart. Confirmation work was done to ensure the project is ready for final feasibility when a partner is secured and to further drill at Iron Cap. The confirmation work included drilling to confirm the reserve model, and that has been completed. Waste characterization drilling and geotechnical drilling are nearly finished. Six drills were turning on the property to get everything done. Proven and probable reserves for the KSM project are 1.2 million tonnes averaging 0.55 g/t gold, 0.21% copper, 2.6 g/t silver, and 42.6 ppm molybdenum. Drilling at the Mitchell, Sulphurets and Kerr deposits confirmed block grades that compared favourably to predictions. The highest grade was from Sulphuret – 0.93 g/t gold and 0.04% copper over 23.5 metres. The best result from Kerr was 0.48 g/t gold and 1.06% copper over 0.48 metre. 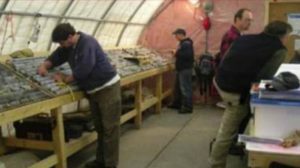 At Mitchell, 0.84 g/t gold and 0.20% copper over 374.1 metres and 0.86 g/t gold and 0.18% copper over 48.5 metres were recorded. The inferred resource at Iron Cap is expected to grow thanks to down-plunge results from the existing deposit. Eight holes have been completed and the final five are in progress. Additional information is available at www.SeabridgeGold.net.